I first decided I wanted to devote time to an online violin learning site about six months before actually doing it. It occurred to me that if done correctly I could help so many more violinists with each lesson than giving private lessons. I've always felt like everyone who wants to learn should be able to do so whether or not they are fortunate enough to be able to afford it. Internet is world wide as opposed to local and I love the idea of connecting to the entire world. Another thing that enticed me is knowing that whatever I produce now can theoretically remain indefinitely. It's obvious that internet will continue to expand at great speeds. One of the first things I did after deciding to start a site was to read a book about SEO (search engine optimization), not having ever done anything like this before I wanted to know what I would be getting myself into and what I needed to do to get traffic to such a site. I began by writing down ideas and future projects. There are no shortages of ideas and my list of things to do is extensive. The biggest problem is finding the time to do it all while also playing to make a living. Fortunately revenue from adsense, Skype lessons and donations are on the rise giving me hopes for a sustainable future income to support my costs and time. One thing that came as an unexpected but positive surprise is that I have developed friendships with so many members and feel as though they are family. One of our upcoming projects are to make a Christmas video of Fiddlerman's members playing a combination of “Carol Of The Bells” and “What Child Is This” which were voted on by our members on this forum thread. This video will be posted on Youtube and shows that we can work together even though we live so far apart. Some members are posting their progress and asking for constructive criticism on the forum. This in essence is a close equivalent to a master class or private lesson though we do it with the greatest respect and appreciation towards each other and learn from others mistakes. I am very proud of how our members treat each other both with love and respect. The famous "Cheap ViolinTest" started something special for fiddlerman.com. 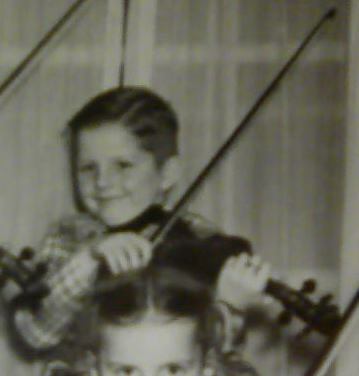 It meant that a person could actually start learning the violin and not necessarily have to spend a lot of money. Theoretically one could buy a violin for $99 and get lessons for free online at fiddlerman.com or other helpful sites and youtube. As a result of my test, Cecilio caught wind of my review and offered to send me instruments provided they could use the videos as they see fit. I of course said yes but made it completely clear that I would be 100% honest about the result, good or bad. This gave me an opportunity to give away more instruments to my visitors. It also allowed me to see what quality instruments are available for the low budget beginner. So far I have given away two violins and am giving away a different violin every other month for at least 5 more violins. Next giveaway will be on Saturday the 8th of October and aired live as usual on Fiddlerman TV at 11AM ECT. Hopefully another similar opportunity will come along enabling me to give away even more instruments. All giveaways and information on how to win have been posted in the news section of Fiddlerman.com. Happy One Year! Thanks so much for all that you do! I love it here, and I'm looking forward to watching the site continue to grow. Way to go! Happy Birthday FM.com , thank you Pierre/FM for putting in the time to create and maintain this site. P.S. we might need a balloon emoticon 😛 for birthdays and congratulations. Congratulations Fiddlerman for a full year of one awesome site. Thanks for all your help. Happy anniversary!! You have created a new path in conducting a site dedicated to violin(and now viola is being added). I say this because in no other forums members' progress are not analysed with either videos or audios; there is no chat/shout box where members exchange their ideas/knowledge. Resources from elsewhere on the internet is also freely shared. This is one forum where I find young minds from .. to 70+. (Mine is 62). I was going through some of the posts originated by Oliver where techniques of right and left hand, speed(https://fiddlerman.com/tutorials/beginners-tutorials/learn-to-play-fast-g-major-scale/), bowing directions etc were discussed. We look forward to more activities in the coming years. I'm very grateful for this site, Fiddlerman, and all the people here. HAPPY BIRTHDAY! HAPPY ANNIVERSARY! Thank you for all that you do to keep this site up and running and enriching all of our lives. thank you so much for offering all this for free! WoW! I missed that !! Anyway , HAPPY past FIDDLERMAN's DAY!! Thank you, FiddlerMan!! Love your site, your lessons, your playing!! You're very welcome. I am happy to be able to help. Second Anniversary is fast approaching for this site and first anniversary for Violaman.com. How are we going to celebrate this? It occurred to me that if done correctly I could help so many more violinists with each lesson than giving private lessons. I've always felt like everyone who wants to learn should be able to do so whether or not they are fortunate enough to be able to afford it. You done it correctly, Pierre. Congratulation's on your forthcoming 2nd anniversary. You are greatly appreciated by all here. By golly you are right!!! The funny thing is reading that the site has between 400-600 unique daily visitors. I'm happy to announce that we have between 1500-2000 unique daily visitors and the number climbs continuously. I guess we can all have our computers on and meet on the shoutbox with drinks and all. Not saying get drunk (there are young ones here) but just hang out at the same time and talk non-sense. I do have a gig that evening though. Sounds like a plan to me, Pierre! Just tell us what time to be there and we can all kick back, relax and enjoy a group conversation! Congrats on the upcoming second year!! I guess I'll be done in Boca around 8:30-9PM or so. Need time to drive home and take off the monkey suit. My guess would be around 10PM Eastern time. congrats my man... you've made some great choices business wise and it shows. I'm one member who passes the web site address along every chance I get...both for this site and the shop as well. I know you do and appreciate it.